Does your marketing work better when you use a social media checklist? I know that when I have a list of things to do, a checklist makes it easier for me. Some people use a digital version. I still like a paper and pencil type of list. OR I put things on my calendar and assign it a time. 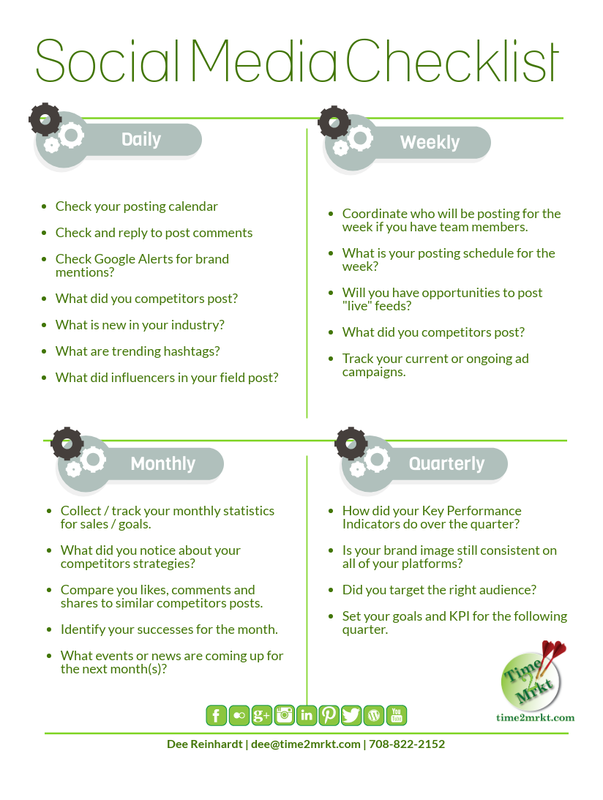 Using a checklist for your social media tasks might work best using the calendar method. That way you can dedicate specific time each day, week, month or quarter to getting the things done for your business including your social media checklist. Some of the things you might want to do would include getting posts out for your business. I like to keep the 70 / 20 / 10 rule for social media posts. 70% of your posts should be content regarding your industry. 20% of your posts should be your own content regarding your industry (like posting this post). Only 10% of your posts should be promotional in nature. That means if you have a 5 posts in a week, 3 should be content you find somewhere else, 1 should be your content and 1 could be a promotion. If all you ever post is sales, people will tune you out. Try to post witty, useful or informative items. don’t always be selling. 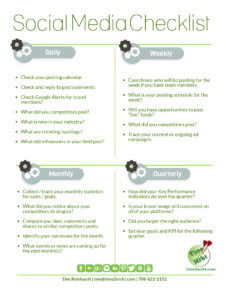 Use the tools on your checklist to help you maintain your posting schedule, monitor your goal achievement, check out what the competition is doing and where you will go next. The original inspiration for this article came from this source.